Show off your favorite plushies! I really adore the Muskedeers (I'm missing Terrakion ATM)...they're the most down to earth legendaries and that's what I admire about them. Keldeo admires them so much he wants to "BECOME A SWORD OF JUSTICE! *insert annoying voice here*"...but I actually like Keldeo...he's my fave legendary after Suicune. 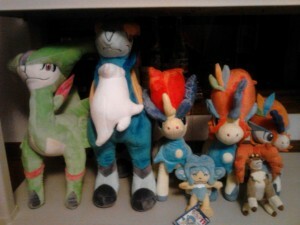 The Tomy Keldeo is so soft.XD I absolutely love em'. I just wish they made a bigger version of em'.